The European Union has over 500 million residents. Greece’s population represents 2.2% of the EU populace. Ideally, a nation’s exports and imports balance, but in the real world, nations generally run trade surpluses or deficits. A trade deficit is a negative balance of trade incurred when a country’s imports exceed its exports. A trade deficit is settled by an outflow of domestic currency to foreign markets. In Part 2: More Sovereign Defaults Are Coming – Prepare Ahead Of The Turmoil, we look at structural causes of the global debt crisis that are not limited to Greece. 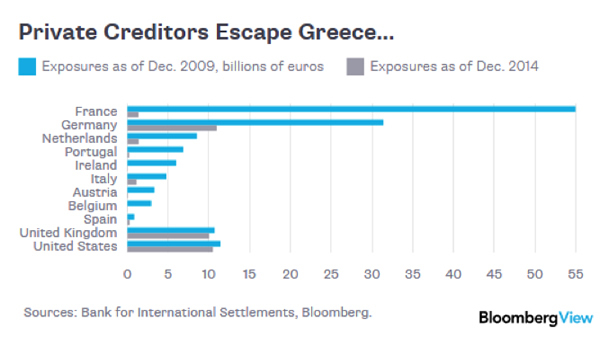 Many other countries are teetering on the same brink Greece is now falling off of. When they fail, the ripple effect their debt defaults will debilitate their creditor nations, causing a massive shrinking of the world economy. The key takeaway is this: even if the countries we live in can’t live sensibly and within their means, we as individuals have the power to do so. But we need to seize that power now, before the next crisis arrives, for it to matter. It is not a marginal question: MOST of Greece business will go on cashing € and spending in the Country ccy, € or NeaDrachma (ND): a restaurant will have bills to Europeans in €, but will buy tomatoes in ND. It is clear that now, next week or in a unknown future, Greece will exit, and soon flourish back for the tourism paradox I have outlined above (our restaurant will handle you a 20 % or 30 % smaller bill in € because tomatoes will be down say 40%, tourism will literally burst up). The second is that the size of Grexit is nil, but the effect is enomous. I’m an Italian, and EU is trying since ever of check the unbalance by devaluting the INTERNAL value of €, reduding wages & in creasing taxation, that is trying to make citizens pay for it. Unfortunately this pulls GDP down, and once debt/GDP ratio is higher than 1 the increase in taxation simply WORSENS situation. It’s simply a DUMB thinking, it seems that EU politicians do not master 6th degree math. So, if Greece switches to ND and survives (and even flourish) it’s utterly obvious that Italy, Portugal, Spain, Cyprus, Malta and finally France will HAVE to follow the pattern. I put Malta too because the funny rules of EU give on head one vote … and require unanimity ! 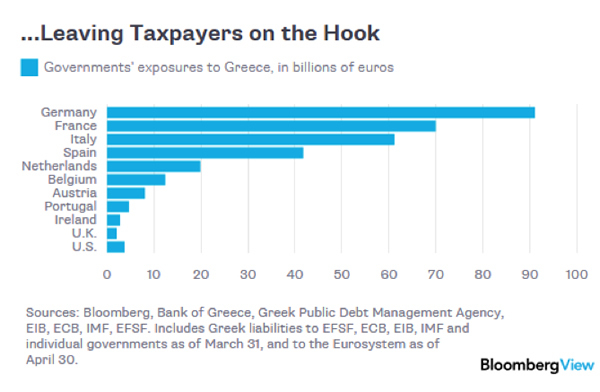 Letting (or forcing) Greece out of € is simply killing €. EU would have been quite better of paying upfront Greece bills and trying to forget, buying time in the (vain) hope that ‘reforms’ will be able to iron away unbalances between0 Netherlands & Latvia, Portugal & Germany. Someone needs to explain to me why the Greeks would reject (wisely) poverty without end, then adopt it a week later. cause Greece is small, and imports a lot more than it exports, it ends up owing more than it can make. so it will never ever recover from EU enforced depression.